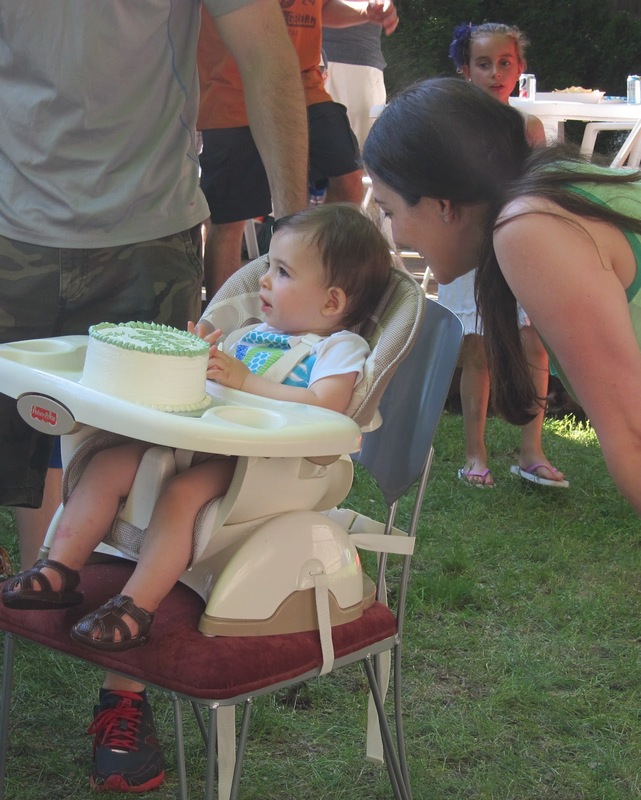 This past Saturday we hosted Dylan's first birthday party! A full year has gone by and our little man is now ONE! I wish I could say that I took a million fabulous photos and the whole party went down like a perfect Pinterest dream, but that is just not the case. 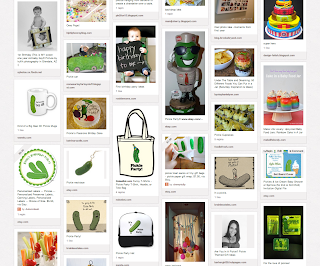 Truth is I barely have any photos that fully document the day and although I executed a pretty hilarious theme, "Pickles and all things that go with Pickles," I don't have much to show for it. They say that the less photos you take, the more fun you had, so I'm going with that. Who said that- I'm not so sure, but I think that saying is just perfect for this occasion. 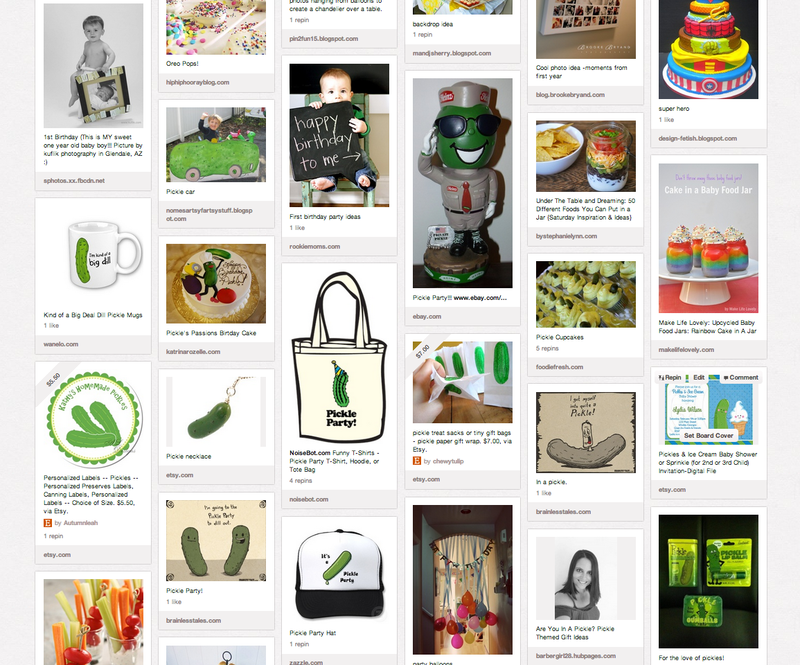 But let's rewind...when pinteresting ideas for Dylan's first birthday, I started to think of and pin foods that went with pickles. I was pretty amazed with everything I found. Gotta love Pinterest! 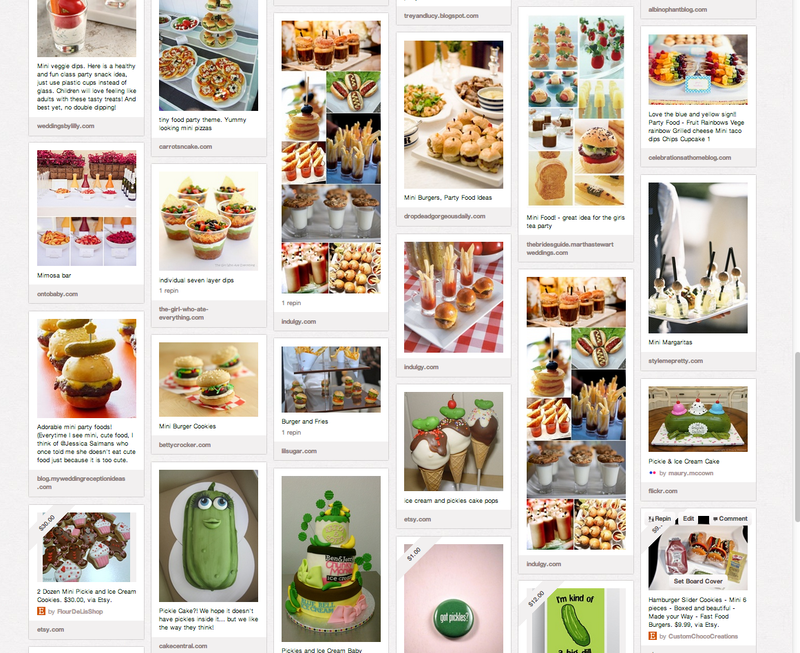 After I came up with ideas, I found a caterer who was willing to go the extra mile for my theme. I used Peppers Catering located in Northboro, MA and they were great to work with. They were pricier than I expected and I was a bit disappointed by how much set up I had to do for how much money I spent, but I was prepared for that by my trusty planning coordinator in advance. I ended up ordering a bunch of sandwiches and wraps, 90 different kinds of sliders that had many different toppings to go with them, an Italian Table Presentation full of breads, assorted cheeses, meats, olives, roasted red peppers, bean dip, etc. 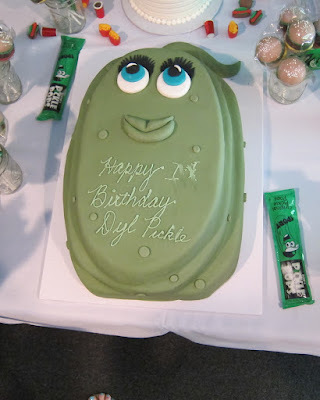 In addition, I ordered a giant cake in the shape of a giant pickle (inspired by the one above) and a Smash Cake. I also ordered pickle relishes for the pickle bar. My friend Jamie also made 4 Large Mason Jars full of DYL pickles! I wish I could show you how delicious all the food came out, but I didn't take any food photos! I know! 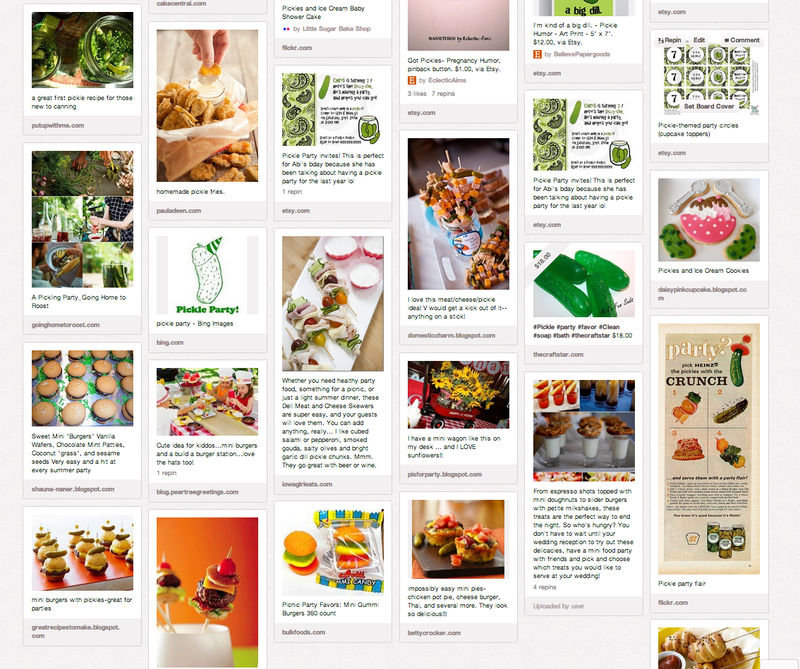 I guess when you're out of the food blogging world, it's easy to forget. But before I go into too much detail about the party itself, check out my invite. 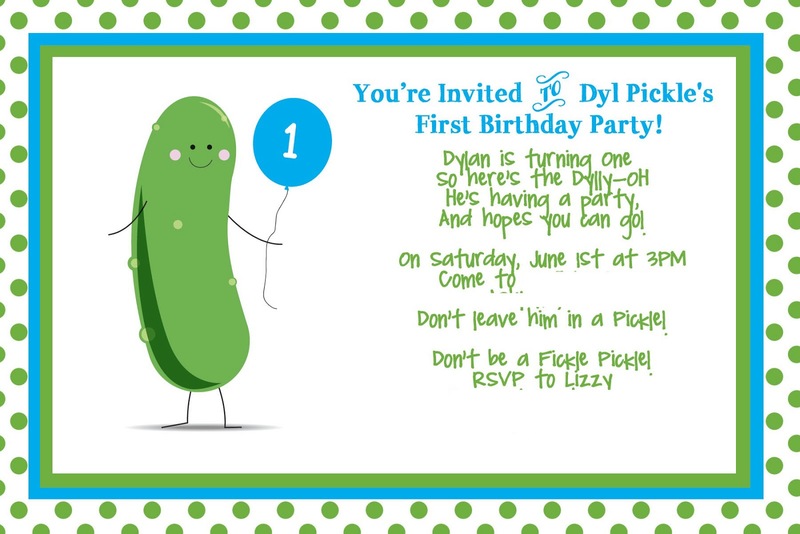 I found the wording on pinterest, changed it up a bit, asked my friend Meg to draw a "cute, happy, birthday pickle" and then I designed the rest of the invite. Pretty fun (and a little ridiculous) right? of shade would disguise 93 degrees. 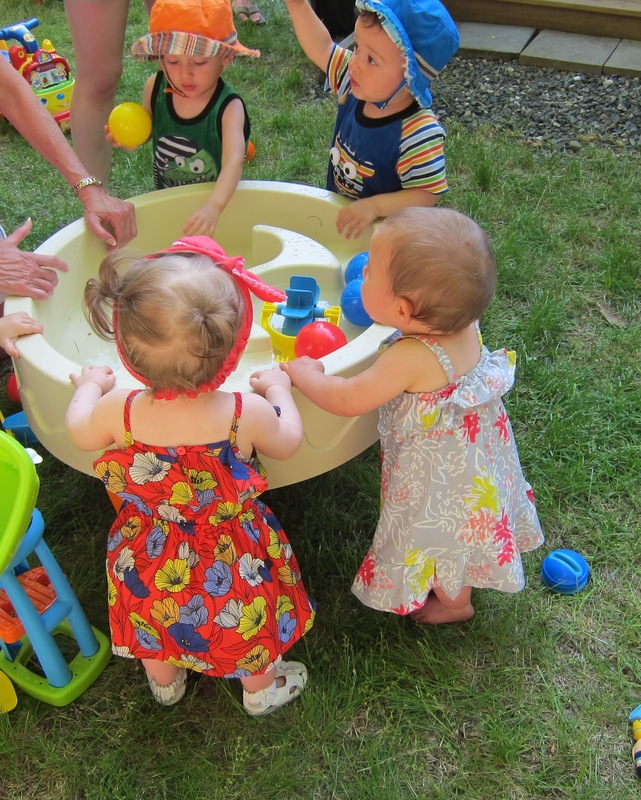 But the kids loved being outside even if it meant the parents were sweating just a bit. We set up the food in our 2-car garage. Completely cleared it out and filled it with three large rectangular tables. Aside from the adult food, I also had a kids table where I put out pouches, baby food jars filled with cheerios and puffs, baby sun-tan lotion, bubbles and little toys for the kids to play with. We also had plenty of water, sodas, and beers. In our basement, we set up the dessert table. 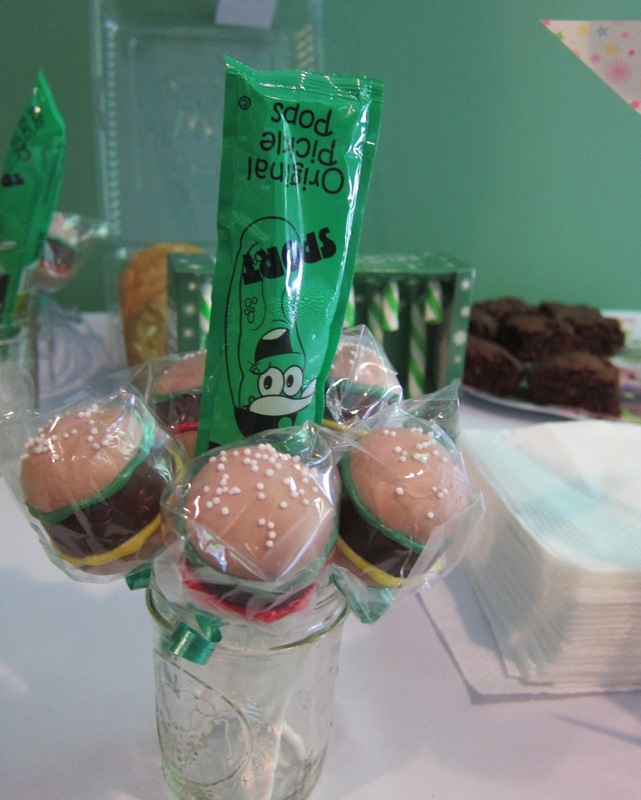 We had tons of cookies, brownies and blondies, the Giant Pickle Cake (totally ridiculous, but amazingly delicious), the Smash Cake, and Hamburger Pops made by Creative Confections by Lauren in Allston, MA. I totally recommend using Lauren for the Cake Pops if you're local, they were so delicious! I found these adorable pops on this post and then starting searching for someone who could make pops like those in my area. Lauren did such an amazing job. I ordered two flavors- one with Cookies N Creme another with Confetti. They were so delicious (and HUGE). My bff Courtney also made the cutest little Hamburger cookies. 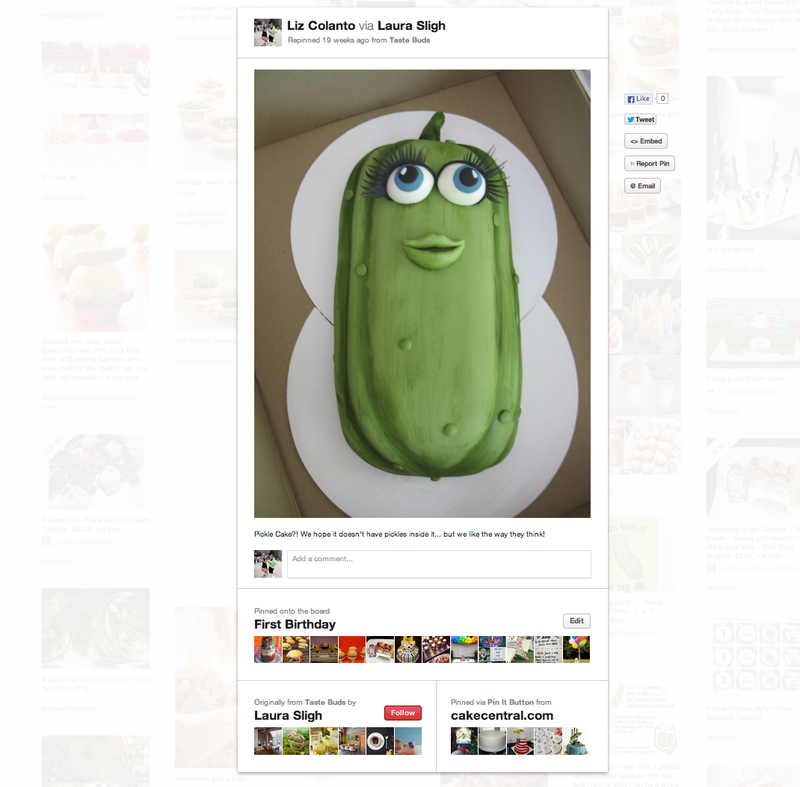 I found the recipe again on this blog, and it was something Court and I planned to make together on Friday. But then my brothers family surprised me and I just wanted to spend time with them so Court took over. (You're the best Courtney!) Aren't they adorable? Made with Nilla Wafers, Thin Mints, Coconut with green food coloring and red and yellow frosting for the ketchup and mustard. I think the biggest reason my pictures are such a disappointment (aside from the fact that I didn't take much) are that I kept my 50mm lens on. The 50 is great for portraits, but not so great for sharing the whole scene. Even these pictures I took of the basement only show what's on the table, not the awesome decorating done by yours truly and my BFF Courtney. Hint.. mainly done by Court. I'm pretty good at coming up with fun ideas, but not so great at executing. My decorations also included a tree decorated with pickle ornaments. Yep, you read that right. No pictures to show for it though. I also had 5 large 20X30 foam core boards printed of pictures of Dylans first year that we hung from the deck. 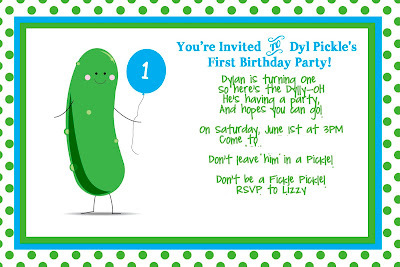 For centerpieces and to display what foods we were serving, I quickly put together these labels- I just photoshopped it together with the pickle from the invite. We used skewer sticks and foam board to put it together. We then placed the sticks in Mason Jars filled with rocks that I had leftover from my wedding (almost FIVE years ago!). Oh... see the screen in the background? I also made a video of Dylan's first year. It's 20 minutes long and I played it on the upstairs and downstairs TVs on a loop. I'll spare you the whole video, but check out the end... it makes all those Monthly Photoshoots of Dylan wearing his Monthly Sticker worth it. Watch my son grow up before your eyes! And to finish off the day, our only family picture. Dyl looks beyond excited right? Happy 1st Birthday Little Man. We love you Dyl Pickle! Today is June 5th, also known as National Running Day. It's a great day to come back from my blogging hiatus, don't ya think? Dave and I also met 8 years ago today! Crazy! Fittingly, we met at a bar after running the Harpoon five miler. See June 5th really is a special running day! 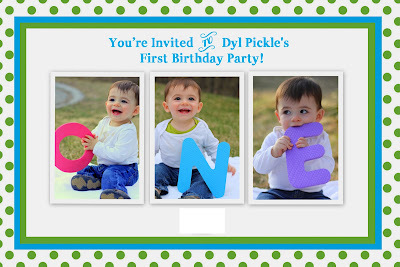 I have a post all ready to go about Dylan's first birthday party so hopefully I'll also get that up this week. I could sit here and tell you how much I currently love running and how I'm finally back on a successful running routine, but that just isn't the case. I've been competitively running since grade school and I'm currently in one of my lull years. I love running, I think about running, I talk about running especially track, but I'm just not doing a lot of it right now. I know it's common, to have ebbs and flows with something you're truly passionate about, and that's okay because you can't be 100% into any one thing every second of every day! 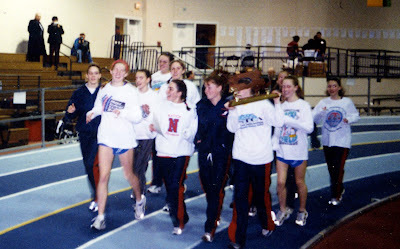 Our Indoor Track Team I captained along with three of my close friends in 99-2000 went on to go Undefeated in our league, win the State Relays and the State Championship Meet. We set 14 School Records that year, 8 of which currently stand. 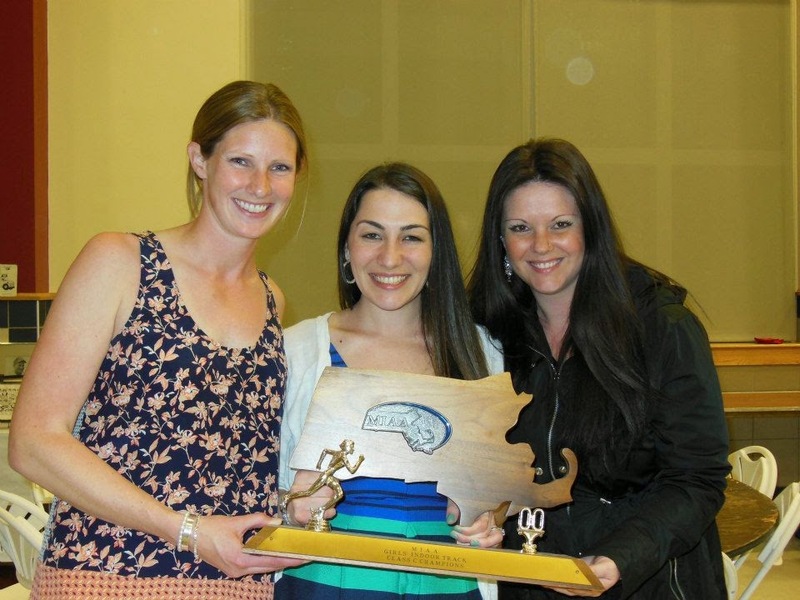 Earlier in 2013, we heard the news from coaches that we were going to be inducted on May 3rd, making us the youngest team and youngest individuals ever to be given such an honor. 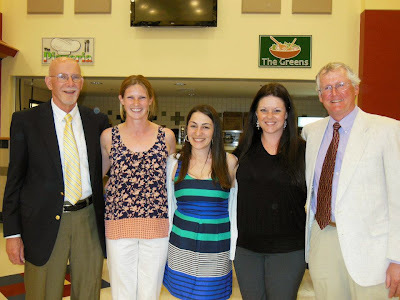 I got together with two of the four captains and we reminisced and planned our speeches. We watched footage that my dad had taped on his big VHS video recorder and we were brought right back. I'm not currently running religiously but I know in my heart I'll always be a runner. I know that when I think about my past and my high school experience, what I remember most is my days spent running around that oval. 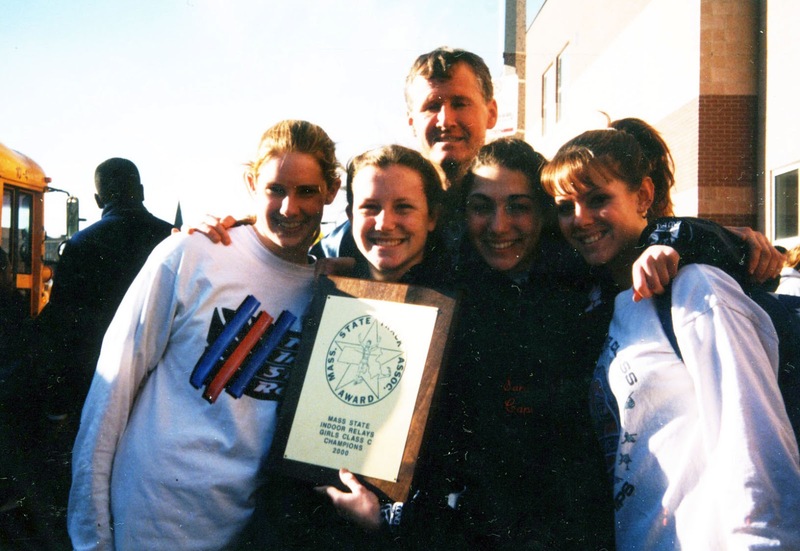 I remember my black Adidas spikes, the bell lap, the baton and my teammates. I remember finishing a race and running to my coach to see if the time he clocked matched my enthusiasm. I remember looking into the stands and seeing my parents cheering me on. I remember holding up those trophies with my fellow captains and thinking life doesn't get much better than this. I reminisced (see that giant scrapbook!!!) 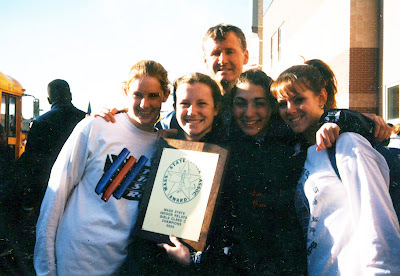 and I tried to show my love for the sport- what it's taught me and what it continues to teach me in the years since competitively running on the track. I also tried to tie back to what happened on April 15th, the tragedy that changed Boston and runners forever. I will someday write about that on this blog, but the right words haven't hit me yet. Here's a little glimpse into the ending of my speech. Running transformed my life and I wouldn't be half the person I am today without it. I still wear my 2011 Boston marathon jacket proudly even though the thought of even walking 26.2 miles scares me. So on June 5th it's nice to take a moment and reflect back on this sport- it's peaks and its valleys, it's highs and its lows and to know that without it, I just wouldn't be me. 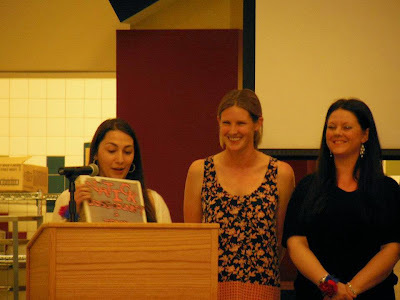 I said in my acceptance speech that people know where I'm from and that I'm a runner before they know much else about me. And that's not because I look like a runner. It's because when people talk about the sport- marathons, track and field- my eyes light up and you can tell how passionate I am about it. I know I'll find time for the sport in my life again - but for now I'm going to relish in the past. Thanks for reading... what does running mean to you?